A hundred scuba divers in the Maldives held an underwater protest demanding the release of jailed ex-president Mohamed Nasheed. While in government, Nasheed famously held an underwater Cabinet meeting to dramatize the threat to his nation. 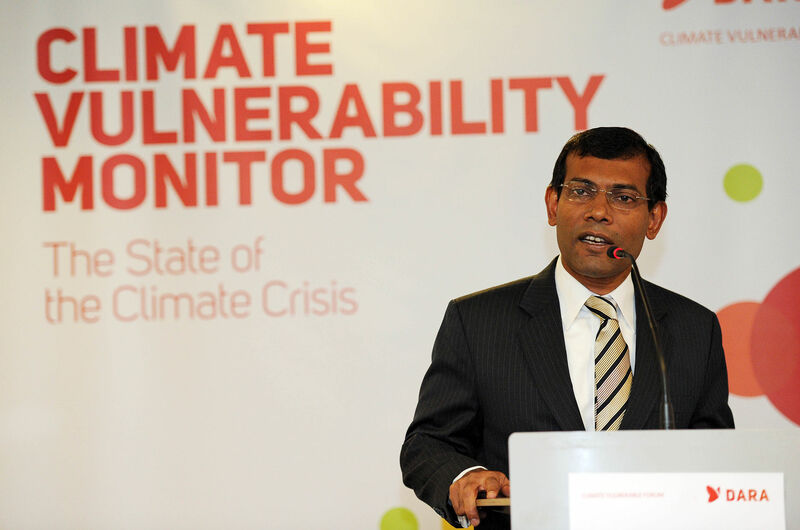 Jailed ex-president Mohamed Nasheed became popular as an environmental activist during his presidency. In the 2008 presidential election, Nasheed was elected as the candidate of the first opposition coalition, defeating incumbent President Maumoon Abdul Gayoom, who had ruled the Maldives as President for 30 continuous years. Nasheed assumed office on 11 November 2008. With regards to the threat posed to the very low-lying islands by changes in sea level caused by global warming, in March 2009 Nasheed pledged to set an example by making the Maldives carbon-neutral within a decade by moving to wind and solar power. He argued that the cost of the change would be no higher than what the Maldives already spent on energy. On 29 June 2010, Nasheed's 12 cabinet ministers resigned en masse, protesting the behavior of opposition MPs whom they said were “hijacking” the powers of the executive and making it impossible for the cabinet ministers to discharge their constitutional duties and deliver the government’s election manifesto. The ministers called on the President to investigate why certain MPs were blocking the government's work, citing allegations of corruption and bribery in parliament. On 7 February 2012, Nasheed resigned as president under disputed circumstances, following weeks of protests by the opposition, which had then been joined by a majority of military and police forces. The next day, Nasheed stated that he had been forced to resign "at gunpoint" by police and army officers, and that the protesters had joined with "powerful networks" of Gayoom loyalists to force his resignation in a coup d'état. Nasheed was sentenced last month to 13 years in prison after being found guilty of terrorism for ordering the arrest and detention of Judge Abdulla Mohamed. Nasheed had accused the judge of political bias and corruption. In a statement released by his office, the 47-year-old called on the people of the Maldives “to confront the dictatorial power of this regime” and “to take all of your lives in your hands and to go out on to the streets”. The verdict is likely to worsen the acute political instability in the popular luxury tourist destination and appears likely to provoke street violence. Nasheed's trial and imprisonment has drawn widespread international criticism and cast doubt over the Maldives' transition to democracy, which began after Nasheed was elected in 2008. Countries including India and the United States have expressed concern about Nasheed’s treatment and trial. We are deeply concerned over the developments in the Maldives. We are monitoring the situation there.